Ready to get your Halloween craft on? Rebecca here from Make & Do Studio, and today I am going to show you a fun and simple way to DIY some Halloween Decor! 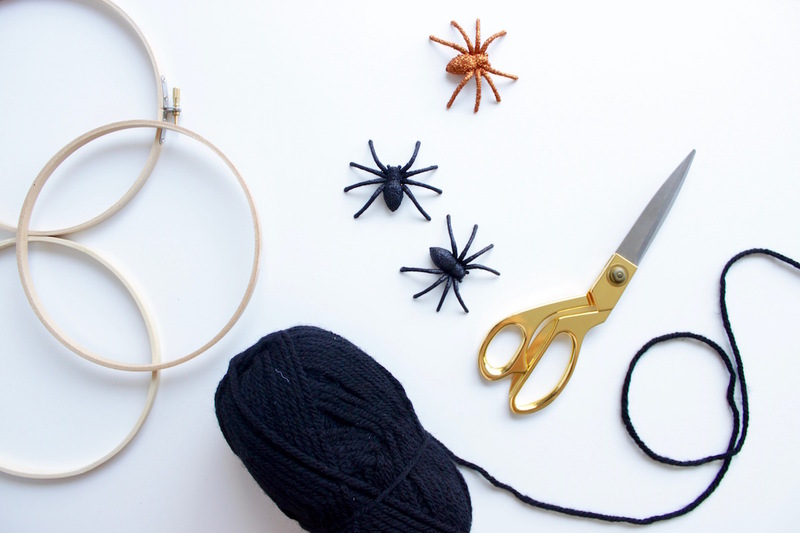 Grab your littles and in just a few minutes, you can transform some basic embroidery hoops into some not-so-spooky but super cutesy DIY Spider Web Hoops. Ok, start with any of the hoops. You can either tie the end to start or hot glue the yarn to the hoop. Wrap the yarn around the hoop a few times, creating a “web” pattern. Once you achieve the look you want, secure the end of the yarn by either tying it or gluing it. I used five hoops in a variety of sizes. I arranged them into a formation that I liked and then used hot glue to secure them to each other. Now, bring on the spiders!!! Once you have all of the creepy crawlers arranged how you want, go ahead and put it up. I used ours above our fireplace and worked it into our Halloween mantel decorations. My kiddos LOVED making these!! Whatcha think? This household is pretty excited with how it turned out. We typically decorate with the non-traditional holiday colors for any given holiday, but this year the kiddos asked for the good ol’ orange and black, and WE LOVE IT!